On December 28 and 29, 2018, several protest rallies were held with the active participation of women in various cities across Iran, including Tehran, Mashhad and Ahvaz. On Saturday, December 29, 2018, the retirees of the University of Medical Sciences in Mashhad held a protest rally in protest to the non-payment of their wages, with active participation of women. 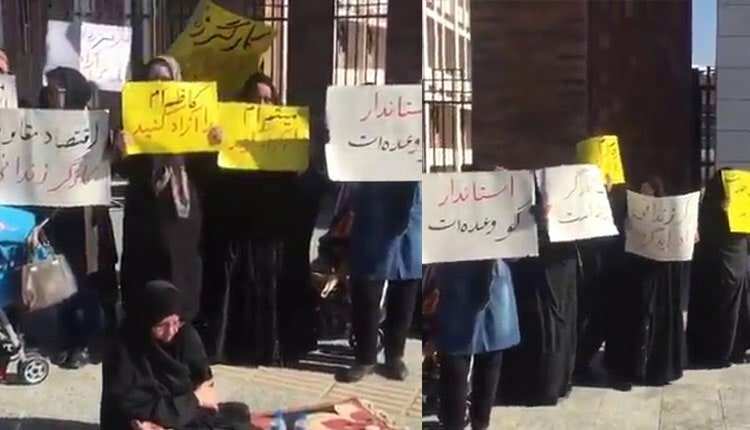 At the same time, a group of family members of the detained Ahvaz Steel workers held a protest rally in front of the Governorate of Khuzestan in protest to the continued imprisonment of the arrested workers. Here too, the active participation of women and girls was a feature of the protest. On Friday, December 28, 2018, the Syndicate of Workers of Tehran and Suburbs Bus Company announced its support for the Ahvaz Steel workers, Haft Tappeh workers and the imprisoned teachers. On Friday, December 28, 2018, a group of staff and faculty members at the Azad University of Meybod held a protest rally. They gathered in front of the Governorate in protest to the non-payment of their wages and salaries. On Friday, December 27, 2018, on the 9th anniversary of the martyrdom of Mustafa Karim Beygi, one of the martyrs of the 2009 uprisings, a ceremony was held at the Karim Beygi family’s house, where his family were accompanied by a group of civil activists to commemorate him. December 28 also marked the anniversary of the PMOI political prisoner Ali Saremi who was the first prisoner to be executed following the 2009 uprising. His family and a number of civil activists attended by his grave site and commemorated him.